According to Daring Fireball's John Gruber, Cook informed employees of the massive uptick in iPhone battery replacements -- 11 million versus an anticipated 1-2 million -- during an town hall meeting on Jan. 3. The new information sheds light on Apple's recent revenue guidance revision for the important December quarter. In a note to investors in January, Cook said Apple is anticipating revenue to come in at $84 billion, well below a forecast of between $89 billion and $93 billion issued last November. While a slowdown in Chinese iPhone sales took the brunt of the blame for the miss, some responsibility was assigned to a weaker than expected hardware upgrade cycle. "While macroeconomic challenges in some markets were a key contributor to this trend, we believe there are other factors broadly impacting our iPhone performance, including consumers adapting to a world with fewer carrier subsidies, US dollar strength-related price increases, and some customers taking advantage of significantly reduced pricing for iPhone battery replacements [emphasis added]," Cook wrote. In light of Cook's statement at the all-hands meeting, it appears Apple underestimated the impact of the popular repair program that cut the cost of out-of-warranty battery replacements from $79 to $29. As Gruber points out, while Apple was aware of the increase in replacements over the course of 2018, said program's effect on iPhone sales likely went unrecognized until the annual upgrade cycle of fall 2018. 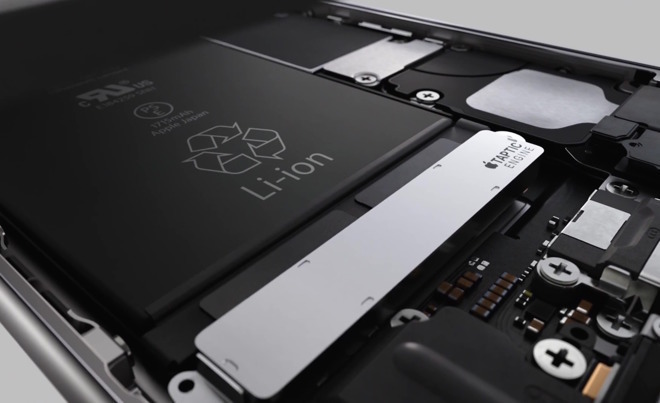 Operating a device with a worn battery can result in shorter running times and, as was the case with certain iPhones, random shutdowns under extreme loads. Apple quietly instituted a performance cap in iOS 10.2.1 to alleviate performance issues and keep older phones operational. Customers were not notified of the change, which led to a major kerfuffle when it was discovered that the peak performance of some iPhones would be artificially reduced under certain situations. A series of lawsuits and probes by governmental bodies followed. Apple apologized for what it characterized as a "miscommunication" in a letter to iPhone owners in late 2017. Directly resulting from the so-called "slowdown controversy" were a number of customer-facing initiatives including the creation of battery monitoring software and tools to disable CPU throttling implemented in current versions of iOS. The battery replacement program, which was part of Apple's response, kicked off in January 2018 and ran through December that year. Is this piece suppose to tell me , 11x more people did exchange battery, and it is Apple's doing good for customers? Or it is because of battery replacement that is hurting sales? And Apple underestimated how popular the repair programme is ? FOR PETE Sake, there are over 200 million ~iPhone 6 / 6s+ out there, and only 5% did battery swap. I think the battery swapping didn’t have much impact, but it will have added to the hurt. Besides, not everybody replaces batteries through an official apple shop, so probably the amount of swaps is much higher. Your math is wrong, but so is the lede "11 times" in this article, even though it's correct further in. 11 million was 9 million more than the 1-2 million expected. And yes it was doing good for customers, that probably was both underestimated by Apple and hurt its sales. We replaced the battery in my wife's SE at the very end December. In early December the phone shut down unexpectedly triggering the performance throttling protocol even though the battery was only 88% (or possibly 86%, I forget exactly now) worn according to the report in settings. So we took advantage of the reduced pricing (knowing the 2019 price would increase 20€) for the battery swap. We were not ever considering replacing her phone this year as she really does not want a "large" iPhone and the smallest one Apple currently sells in Germany is the iPhone XS. So for us the reduced price for the battery swap only pulled in the exchange from 2019 to 2018; it didn't push off a phone sale from 2018 to 2019. If Apple comes out with a smaller format phone in 2019, we will buy her a new iPhone even though we just replaced the battery in her SE. I don't think that all (or even most) 9 million extra battery exchanges in 2018 translate to lost new phone sales. However, if we then buy a new phone in 2019 to the casual observer it would look like we did exactly that: postponed our "2018 purchase" to 2019 because we swapped the battery at a reduced cost. It would be better if Apple kept their mouth shut on this topic, instead of trotting out numbers that can be interpreted negatively in a big way. It is almost as if Apple is sending out an invite to tech media to troll them now. "So why would Apple want to do this? What is the logic of this durability focus as a business model? It may be good for the environment but is it good for the bottom line? Fundamentally, Apple is betting on having customers not selling them products." Troll all they want, but Apple already leads in longest lifecycle for their iPhone line. 11 million battery replacements for the program, for an iPhone series the began with the release of the iPhone 6 / 6 Plus in 2014, and includes other, newer models to a lesser extent, in a timeframe that Apple sold 800 million iPhones. I'd be bragging about that actually, but certainly not using it as an excuse for lesser sales last quarter, which is the impression that most people came away from Tim's statement. It certainly belies the extent of the "throttling" story by magnitudes. The program absolutely reduced the bottom line ... 9 million more replacements times the average selling price (let’s say it’s $720) is approx $6.5 billion gross revenue. You could conservatively argue that half of those users would have upgraded, that would at least explain about $3billion in shortfall. I for one continue to use an iPhone 6 with the new $29 battery, I would have bought the XR otherwise, since performance prior to replacement was poor and would not have spent $79 for a battery replacement. Longer term, will these new ‘refreshed’ phones be handed down to others? Could this be part of the overall strategy? Since every operating iOS device out there potentially earns Apple service revenue (App Store, iTunes, accessories). So is Apple taking a loss on these battery replacements or did they price them artificially high so people would opt to replace the phone instead of batterry? I think in the long run (now that the program is done) the battery replacements will mean that user will upgrade in 1 to 2 years and Apple will have a bump in their Sales. Some People may even upgrade to an XS instead of XR. My Merc needs a new alloy wheel—I think I’ll buy a new Merc? I say there will be a bump in the next cycle in the US. China & India markets is a different story altogether. The reality is Apple’s build quality is high - I have a mid 2011 iMac, iPhone 5s and 6 still in use daily, and a perfectly fine 6 year old ipad. The days of upgrading every 2 years is gone (this was mainly artificial due to the teleco’s 24 month payment plans). The technology lasts longer, and there hasn’t been a truly compelling reason to upgrade unless you crack your screen or your battery doesn’t hold a charge - both of which have also been improved. Apple didn't trot the numbers out in public... it was LEAKED. So is Apple taking a loss on these battery replacements or did they price them artificially high so people would opt to replace the phone instead batterry? It depends on how you account for it regarding "taking a loss." Labor isn't free, and a battery replacement isn't a 20-minute job. Curious why an employee would leak it to John Gruber. I can’t imagine execs at Apple would want this figure out there. Certainly one of the bigger upgrade cycles in iPhone history. We participated, and now have a new 6 for years to come. I wonder as well. Numbers coming from Gruber are taken as gospel, which means that the news would spread like wildfire. If the purpose of the battery program was "Apple making a bet that sustainability is a growth business" why would they have discontinued it so quickly? As Horace said, he's offering a defensive explanation of it. The rational explanation says they had created a BAD PR situation with the intentional throttling stories flowing out of the iOS update and needed to do something positive to counter them. Thus the battery program for which they got GOOD PR. IMHO if only 9 million more iPhone owners took advantage of it than would typically have, and many of them did so in an earlier quarter anyway, and not all 9 million would have been upgrading to begin with, it doesn't seem to me like the program could have had much impact on current sales. What, maybe a couple million or so at most in lost sales attributable to this quarter? I'm a bit surprised after reading about the numbers Mr. Cook even raised that as a major factor, specifically mentioning it as one there at the All-Hands meeting and in public statements too. It does leave the impression of being something negative rather than a positive, just the opposite of Horace's slant on it as "Apple betting on customers rather than selling them products." Wonder how many were dodged by not sending out a notification to come in for a free swap, with the 6S bad battery batch. I think we've reached a point in time where iPhone's have so much horsepower that when your phone battery is dying, the choice to buy a new phone or replace the battery leans towards just replacing the battery and keeping the phone another year or two. My iPhone 7+ is a great phone. It does practically everything a Xs or Xr would do. In another year or two, that might not be the case, but for now my almost 30 month old 7+ works just fine and looks like new. I wanted to take advantage of the battery replacement deal, but my battery is still at 93% health and it didn't make sense to have it replaced. I know I'm responsible for 4 of those: 3x iPhone 6 for my kids (2 of those handed down to my kids from my wife and I) and then my iPhone X. The intent will be to extend the life of those phones (and I tend to hold on to my phone longer than Apple would like...) so I'm sure the whole thing will hurt Apple's sales overall. Some will say that it didn't make sense to replace a battery that was still fine (94%) but I waited until mid-December so it was over a year old. Ultimately my X will last another 2-3 years, at least. Getting an "extra" year out of it for $30 seemed like a no-brainer to me.